Knitters have all kinds of tricks. We have ways we like to do things, little rituals that make the time we spend knitting work for us. We have tools that suit us, and we become so used to them that we think we can’t knit without them. One of the things I can’t do without is my little toolkit-on-a-keychain. It’s not fancy, but it’s portable. Over the years I’ve fine-tuned it until it holds just about everything I need while I’m knitting (except scissors and a tapestry needle). There’s a a tape measure, a needle sizer, miscellaneous stitch markers, a rescue crochet hook, a rubber thing to tighten interchangeable needles, and just in case, a little tag with my parents’ 1961 Virginia license plate number on it. I never know when I might need the number of that big blue Ford station wagon. 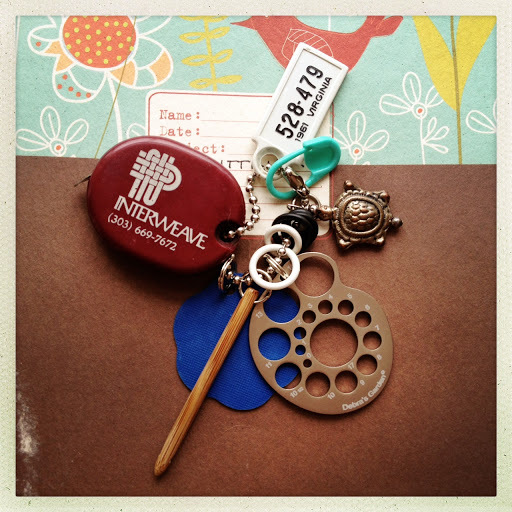 Do you have a little knitting tool kit? What does the turtle do? Besides hang there and look awesome, natch. It's technically a stitch marker, but it's really there because I am Turtle. I don't, but now you come to mention it, I probably should get myself one! I have one…but it's in a wee zipped bag which I think I bought from Knit Picks quite some time ago. An old trick of mine is to thread the tapestry needle onto the safety pin–and add one more essential to your bag o' tricks.